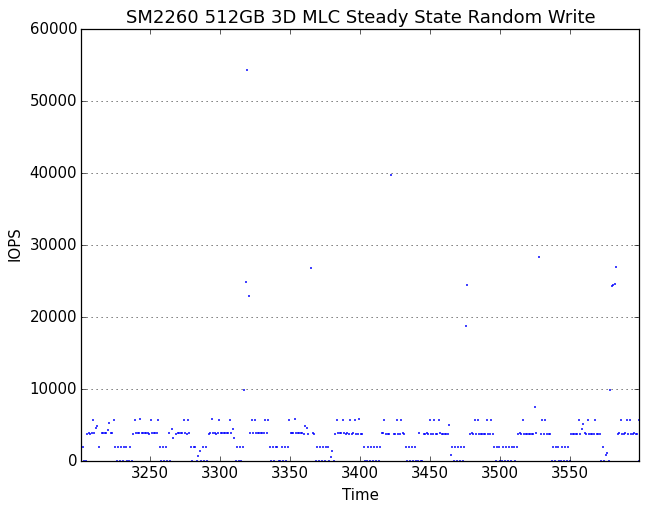 The SM2260 sample has relatively poor steady-state random write performance given that it uses NVMe and MLC NAND. The use of SLC caching and the lower than normal spare area of this drive both contribute to poor steady-state performance but may not significantly impair short-term performance. 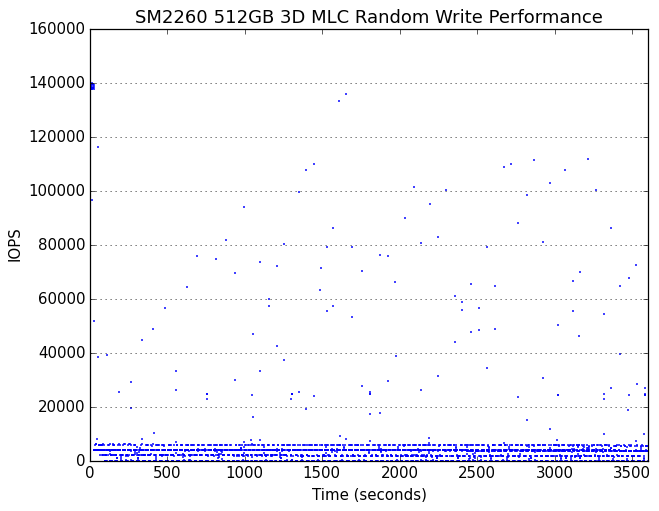 The SM2260 sample has an even lower consistency score than the Intel SSD 600p, which uses basically the same controller and TLC NAND, but has substantially more spare area. After the very short initial burst of great performance around 140k IOPS, the SM2260 sample transitions abruptly to a steady state that it maintains throughout the rest of the test with no long-term shifts in behavior. With extra overprovisioning reserved, there's an intermediate phase consisting of mostly performance around 80k IOPS and second burst at 140k IOPS before a higher performance but no more consistent steady state is reached. 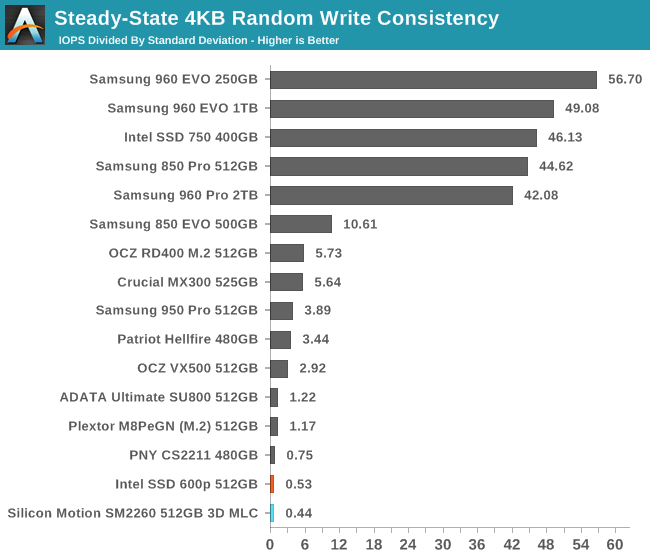 Looking more closely at the steady state, the SM2260 sample is mostly shifting between four performance levels, with the most common being around 5k IOPS. However, when it goes through periodic phases of lower performance, it is stuttering hard and will often go for an entire second without completing any I/O. This is clearly poorly-managed garbage collection, possibly exacerbated by thermal throttling and definitely suffering from insufficient spare area. With more overprovisioning, the severe stuttering is all but eliminated and the normal performance range jumps to around 24k IOPS with periods where it drops to around 6k IOPS. Guess it's a sub 200$ drive, we'll see how it does against WD's offering and Plextor M8Se. 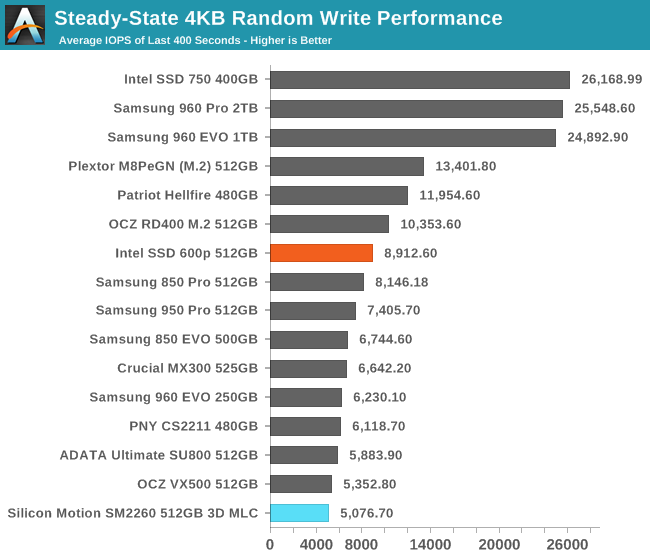 Isn't the Z97Pro bottlenecking the drive? Please consider pointing that out in a test bed info next time, so people will know what to expect with a similar combo (z97+m.2).